It is said that God works in mysterious ways and that was certainly the case when ‘Joan of Arc’ became the savior of France in 1429. 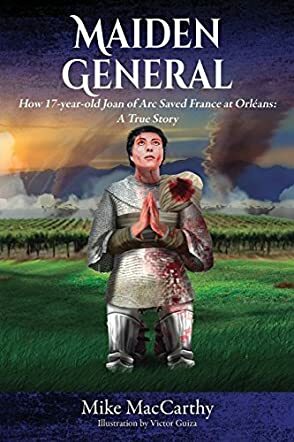 Maiden General: How a 17-year-old Girl Saved France at Orleans: A True Story by Mike MacCarthy tells the true story of a 17-year-old virgin farm girl, Jehanne. Since the age of 12, this young woman had been receiving messages from God regarding removing the English from French soil and ensuring that Charles VII be crowned King of France. After defying the odds to obtain a meeting with the Dauphin, the heir apparent, and gaining his trust and support, Jehanne went on to lead French troops into battle to lift the siege of the city of Orléans. Jehanne’s devotion to God and her deeply held Catholic beliefs enabled her to inspire the men to fight and, in spite of serious injuries, she led them to victory, bringing the Hundred Years War to a close. From humble beginnings, never asking for praise, Jehanne trusted in the Lord, dedicating her life to His purpose for the sake of her country. The history of 15th century France and the Hundred Years War comes alive through the detailed yet engrossing narrative masterfully created by Mike MacCarthy. Full of passion, Maiden General: How a 17-year-old Girl Saved France at Orleans: A True Story paints a clear and poignant picture of life in the French countryside and court, as well as providing a touching testimony to the intensity of Jehanne’s belief. To read this tale is to marvel at the accomplishments possible through absolute faith in and devotion to God. All history should be written this well! This is a beautiful story and the author's passion is obvious. If only more people listened to what God wants from their lives, imagine what a wonderful place the world could be!